Home CD-R King Entertainment Google Glass News technology Will CD-R King Sell Google Glass in Philippines? 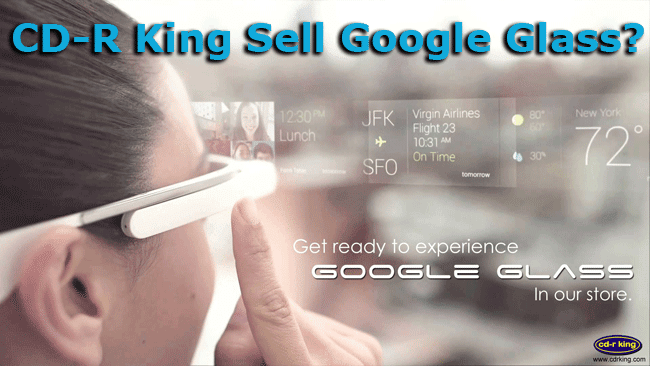 Will CD-R King Sell Google Glass in Philippines? A certain announcement on Facebook by CDR King surprised the people. This is with regards to the selling of Google Glass by CDR King which is a computer glass that one can wear by the company. Many could not believe that this will happen soon and we will be able to purchase the product on several stores nationwide. For the record and information of many, when it comes to cheap China-made products such as gadgets and the like, CDR King is famous. The thing is you will be able to purchase your desired accessories for your gadgets of different designs at the lowest prices are available on CDR King. The question now is will they really sell the said Google product considering the fact that it costs $1,500 which is around P65,000? And another issue is that when time comes, the said product from the giant company will be sold in the Philippines ahead of US and is very unusual. Well, with regards to the original product, there is no exact price on CDR King and the company will update us soon through its Facebook page with regards to the details of the product. As for now, the information that we gathered is that they will sell an imitation of the of the product called GoogleGlass starting at the third quarter of 2014. If you would like to be updated on the release of the Google product, you can subscribe to CDR King’s Facebook page or you can keep yourself updated by CenterTechNews. And we will surely update you on this. 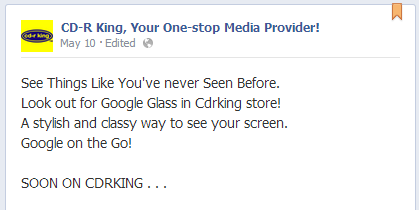 CD-R King just want to make a fuss with the Google Glass trend to promote their store. It is later posted on their facebook page that the statement was a fake and they apologized for the incident.